Immortalize yourself on a giant Assassin's Creed 4: Black Flag canvas! Ubisoft will probably become my favorite company soon. Not only because of its high quality products, but due to the fact that it delights us constantly by the most pleasant news and surprises. This time, Ubisoft has launched a truly interesting and ambitious contest for Assassin's Creed 4: Black Flag fans! If you really like Assassin's Creed game series, now you have a unique opportunity to become part of the history of this saga. 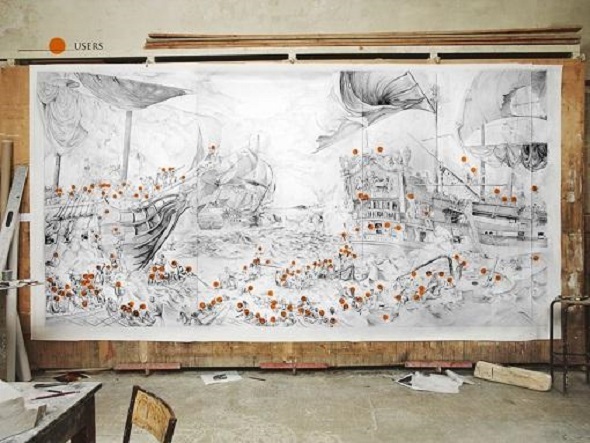 So, your face may appear on a giant Assassin's Creed 4 canvas (2.3 x 4.5m), which shows the great naval battle of the Pirates Golden Age - XVIII century. This painting has already an esquisse, which you can see below, and will be performed by famous masters of the Beaux-Arts school in Paris and will be presented from 4th of November to 3rd of December 2013 at the Paris Games Week in Musée de la Marine. In order to take part in the AC4: Black Flag contest, you have to select one of the 137 characters depicted in the esquisse and in which you’d like to embody. Then you must make the photo of yourself conveying the emotions, that this character should experience (in your opinion, of course) and send it to assassinscreed.com/defyhistory. The happy winners will be determined by voting in social networks. So, if you really want to win the AC4: Black Flag contest, then get your friends, relatives and acquaintances in voting. Immortalize yourself on the giant Assassin's Creed 4: Black Flag canvas! We would also like to recall you that AC4: Black Flag game will be released October 29, 2013 for PS3, Xbox 360 and Wii U, and a little later for PS4, Xbox and PC.